Needs in-game verification. See the OPRP project page for explanation of what needs to be done to complete the verification process. 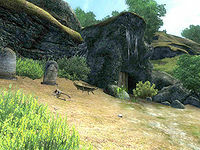 Smoke Hole Cave is a medium-sized cave between Kvatch and Anvil containing undead. It contains three zones: Smoke Hole Cave, Smoke Hole Brass Tomb, and Smoke Hole Boot Tomb. This cave contains 10 Cairn Bolete plants and 5 Wisp Stalk plants. 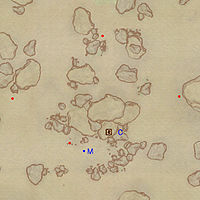 This location's map marker (M on map) is named Smoke Hole Cave (editor name SmokeHoleCaveMapMarker). The entrance door is NE of the marker, 60 feet away. A broken tombstone west of the cave's entrance can be activated to display the message "[epitaph missing]". The center tombstone can also be activated, but as its associated script is not linked the object nothing will happen. The message it should display is "Let the Weeping Cease. Lucina Faleria / Died S Dawn 19 421 / Aged 47 yrs". This cave is a bit of a maze. It contains three zones - the initial zone, Smoke Hole Cave - and two zones which attach ONLY to Smoke Hole Cave, not to each other which are accessed at doors C and D.
You enter the zone and walk into a large room with a bridge over a large pit. There are five enemies down in that pit who may be able to detect you. 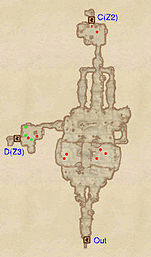 If you have a strong ranged attack or spell, you can attack from the first half of the room, killing them in the pit or forcing them to come at you across the bridge (thus giving you a good bottleneck to damage them down before they reach you). You may either jump down and loot (but be warned this will likely result in damage) or you may cross the bridge. There are three hallways on the opposite wall. The central hallway leads into the northern room where you may access Smoke Hole Brass Tomb, through door C. Alternately, you may go down either the left or the right tunnel (they both lead to the same path). Heading down the path, you will have the option to turn left or right at the dead end. Turning left will take you into the pit from the first room. Turning right will take you to the third zone, Smoke Hole Boot Tomb through door D. Since this is not a linear cave, it does not matter whether you do the Boot Tomb or Brass Tomb zone first. The first room in this zone leads to three paths. Make sure to loot the chests in the northern and western paths first. 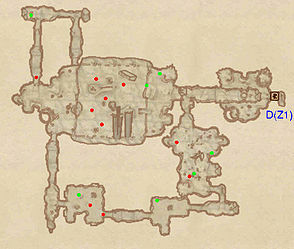 While there are two chests in the western room, one of these is apparently bugged- located behind a wall and inaccessible. Each path is linear. 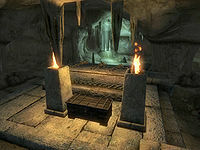 Assuming you have looted all of the chests, you will have found both keys to the inner and outer tomb doors. These keys let you in to the room with the boss-level undead and chest. Except for the two chests and the skeletons on the central platform, there is not much in this end room to loot. The first room in this zone contains a drop off with no apparent way back up. You will eventually return to the entrance through a hole in the ceiling at the end of the zone. 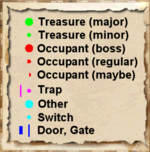 If you are going to want to head back to town to unload and sell treasure, you probably should do that before entering this zone. You should be able to kill a few of the enemies in the first room by using ranged or magical attacks before you jump down. Be warned you will likely take some falling damage when you drop down, so make sure to regenerate your health before you make the leap (it's possible to make it down without taking damage if you go to the right side against the wall, look straight down, move to the edge so you start to slide, then as you fall try and stay against the wall). The only exit to this room is in the northwestern corner. This path will take you up to the upper level of the first room on the other side of the pit. From here it is a linear path to the hole in the floor that drops you at the entrance to the zone. Again, be wary of fall damage. This page was last modified on 25 March 2018, at 03:14.